Accroding to the statistics, Yiwu market has become of the biggest circulated foundation for stationery and sports supplies in China after so many years’ development. However for overseas market, more and more China made stationery supplies through the Yiwu stationery market go out of the country, entered into Europe, USA, and South Africa etc. Yiwu stationery market is the small part of China Yiwu the International Trade City, district 3, on the first and second floor. 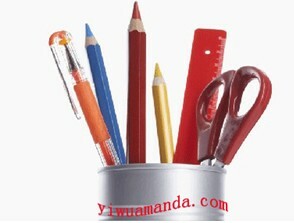 Yiwu stationery market is a very hot place of the Futian market for school stationery and office stationery. First and for most, the price of some common stationery such as the tapes, ballpen, notebook, paper, sharpener, ruler, file folder, stapler, brush holder, packing bag and so forth is very competitive, owing to this can help you to capture your domestic market at a short time. Further more, you can bring your hot stationery to Yiwu or just a photo, and the suppliers can according to your requirements to make a special order. What’s more important, if you come here, Yiwu stationery market also have some novelty itmes will surprise you impressively. Seeing is believing! By the way, if you are planing to come to Yiwu but have no know idea about how to choose a reliable export in Yiwu, please don’t hesitate to contact us.